What has zero nutritionally redeeming qualities and is one of the most delicious things you can stuff in your face? 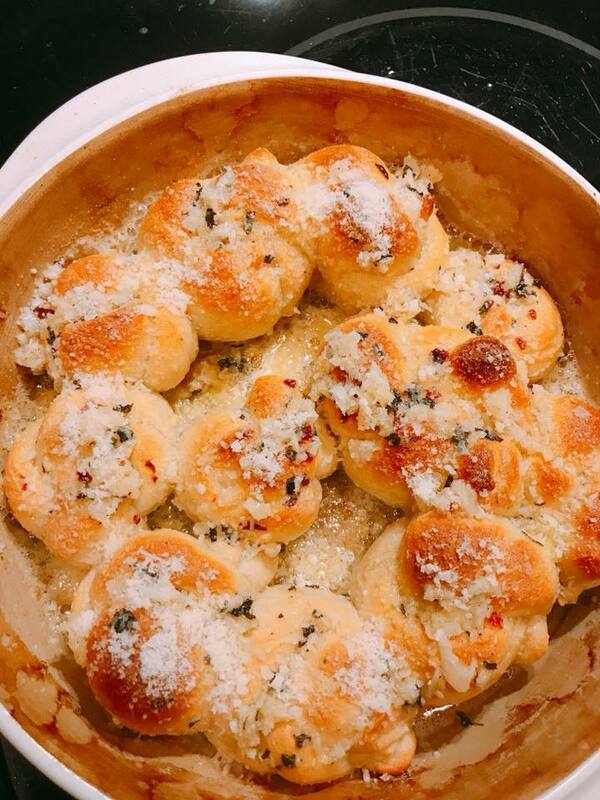 The answer to this riddle is garlic knots. I could have made that into a real riddle, but do you really need that kind of stress this time of year? Probably not. Garlic knots are a specialty of pizzerias and Italian restaurants in the Southern Tier, although in the North Country, Wise Guys and Stefanos also offer really yummy ones. I’ve had some bad examples, too – with under-seasoning, over-baking, and under-buttering being the chief crimes leading to unsatisfactory knots. Please, never let your knots be under-buttered. It’s a grievous error. I’ve tinkered with my knot recipe for probably the better part of a year, though sporadically. One just cannot make knots that often – or can they? Because now that I’ve perfected them, we want them constantly, and I’ve made them once a week for the last month. It’s becoming a bit of a problem, actually. I wouldn’t want to deprive you of buttery, cheese, garlicky goodness any longer. So here’s the recipe. Pick up each piece and roll between hands into a long, skinny snake-like rope. Tie that rope into a round knot, then another one on top of the first and drop into a baking stone baker. I got mine from Pampered Chef, and while I don’t usually promote such things, it really does a good job with pizza dough. Proceed through the rest and bake them at 400 for 18-20 min or 500 for 12-15 min; until golden brown. Add your garlic to the butter and oil in a small bowl and microwave for 20 seconds, then add spices. As soon as the knots are out of the oven, brush generously with the garlic butter mixture, and then sprinkle with cheese.